Every writer should develop the skills to proofread their own work. But sometimes, especially when you’ve invested so much energy and emotion into creating your book, it’s hard to see your own writing objectively. Of course, it’s important to present a professional piece when you’re submitting short stories or poems to literary agents and editors. 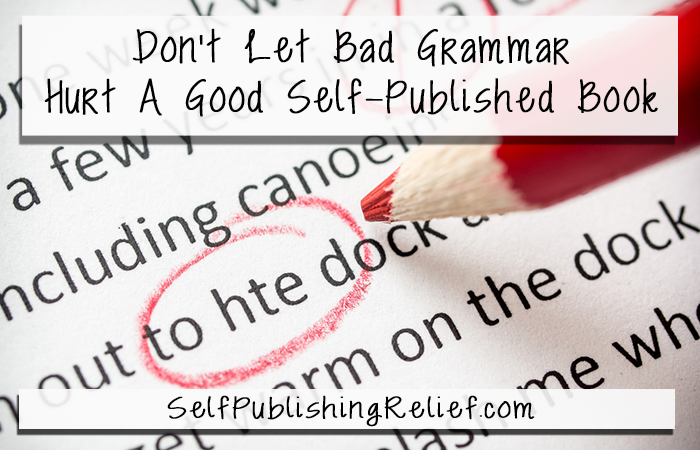 But when you’re self-publishing, thoroughly editing and proofreading your book can mean the difference between getting great sales and great reviews…and watching your book flop because it’s filled with typos and grammar gaffes. So it’s important to proofread…proofread…and proofread! And then, proofread some more. The more people who see your work, the more wrongs will be righted! Good proofreaders can be friends or relatives who are nitpicky spellers and who will spot a dangling modifier from a mile away. English teachers, librarians, and other writers are excellent choices! You can also pass your work around a writers group, critique circle, or book club. And you can always contact us at Writer’s Relief. Only 2% of the hundreds of proofreaders who approach Writer’s Relief each year are approved to work with us. Our experts will format your book to industry standards and provide a careful, line-by-line review. Don’t rush the process. It’s natural to be eager about getting your book self-published, but your reputation—and the success of your book—are on the line. Make sure your writing is as polished and perfect as possible. Run a spell-checker program. This tool does catch many misspelled words, but keep in mind: it has limitations. Make sure the language is set to standard U.S. English and remember that the spell-checker program doesn’t know the difference between too, to, and two! Take a break. If you aren’t on a strict deadline, take a little time between the final writing and the proofing for a more objective view. You’ll be surprised at how much more effective you’ll be at catching misspellings and grammar errors when you read your work with rested, refreshed eyes. Print out the pages. This is easier with shorter books, but going over each line on paper is different than seeing the work electronically. Get out your red pen—and consider it an important second line of defense. Read your book out loud. Not only will you spot areas that are choppy, verbose, or disjointed, but you’ll be able to hear if you’ve left out a word or if a sentence makes sense or not. Review your work from bottom to top. Most professional proofreaders make at least two full passes, and many recommend that one of these passes starts at the end of the work. While you might not want to read the entire book backward, you can review each page by reading from the last line at the bottom up to the first line at the top. Pay special attention to problem areas. Most mistakes happen toward the end of the page. And don’t forget to double-check quotes, brand names, headers, footers, endnotes, references, and chapter titles. Change your focus with each proofreading pass. In other words, first proofread your book for spelling, punctuation, and grammar. Then go through the book again, this time with an eye toward whatever other types of mistakes you tend to make: verb tense mistakes; POV inconsistencies; changes in the spelling of character names or mythical countries, etc. After all the hard work, time, and money spent, you want to be sure your self-published book has all the advantages you can give it: a great story, the right cover, and expert formatting and proofreading. Typos, run-on sentences, and homonym mishaps can detract from your book and result in bad word of mouth among readers and reviewers. So whether you choose your next-door neighbor or the Writer’s Relief proofreaders, make sure you leave a great impression on your audience with a professional product. 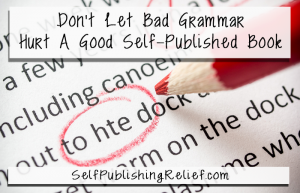 Don’t let bad grammar hurt a good book! QUESTION: Do you have a tried-and-true proofreading trick? ← Which Self-Published Genres Sell The Most Books? Self-Publishing Relief Has The Answer! Thank you so much for these wonderful tips. I enjoy all the helpful information you offer to writers. It works well if you work in tandem with someone else who enjoys proof-reading. This was VERY good! Thank you. This tidbit had many areas of interesting info that I will use in my next book. actually a good spell checker, as in MS Word, DOES know the difference between two, to, and too. I went two work. will result in the word ‘work’ being flagged. I went to work, will result in no errors. I went too work, will result in both ‘too’ and ‘work’ being flagged. Its up to you to work on the sentence until the errors disappear. however, the principle is correct that they are not perfect. My favourite is “Can I peal an orange?” and “Can I peel an orange?” both of which are accepted as accurate.